The listed aquaculture sector continues to expand. 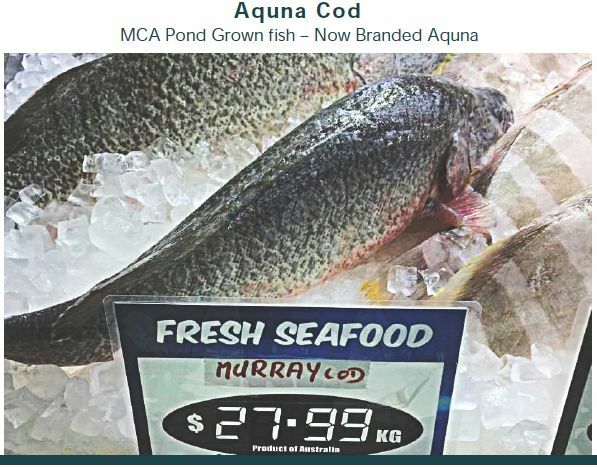 Last month a relatively recent entrant, Murray Cod Australia Ltd, produced its first 100 tonnes of Murray Cod, which it describes as a rare and premium native fish. The company was originally Timpetra Resources. 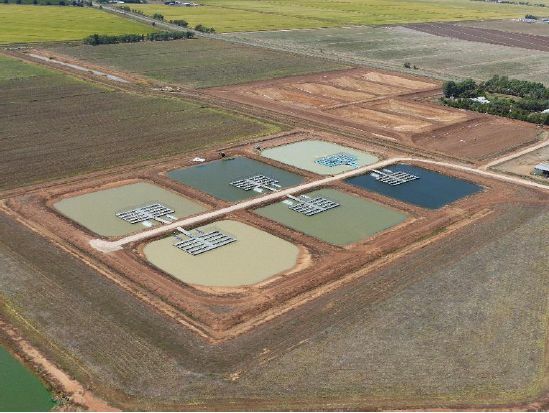 In January 2017 it changed its activities by acquiring Bidgee Fresh Pty Ltd and the businesses of Riverina Aquaculture and Silverwater Native Fish. It also raised $10 million in new capital. The company claims it is different from other listed fish farmers in two ways. Firstly, its fish, the Murray Cod, which it markets as Aquna Cod and as "one of the world's rarest luxury seafoods". Secondly, its production is land based using outdoor open fish ponds. The company says land based production has numerous advantages. It considerably reduces costs and risk as there are no issues with bad weather or predators such as seals and sharks. Risks are usually limited to one pond. Access is easy and immediate compared to ocean pens, and equipment in fresh water does not rust as fast as it can in salt water. On the environmental side, water useage is very low. The system has strong synergies with irrigated agriculture and can provide irrigation farmers with a second use for the same water, thus increasing their water efficiency. And rising water temperature from climate change is not an issue as it is with ocean aquaculture where it can affect the fish and production. Other environmental risks are also reduced or eliminated. Among these, no waste water leaves the property, no fish escape, the ponds are not near to any native waterways, and the risk of transfering disease to local fish populations is "almost non existent". Waste is not a liability as the nutrient enriched water is used to irrigate adjoining crops and pastures. Overall, Aquna cod farming has a low environmental footprint, says the company. The fish is a native of the Murray Darling Basin, but no commercial fishing of the species is allowed as it is listed a vulnerable species. The company is part of a NSW State Government restocking program where it breeds and raises fingerlings. Over 500,000 of its fingerlings have been released into the Murray-Darling Basin river system. Aquna cod is one of the world's largest freshwater fish and mature fish have been caught that are noticeably longer than a man is tall. 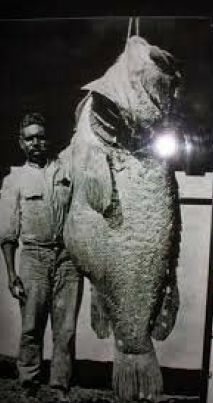 Above: Murray Cod in the old days. Below: Fish for sale at Melbourne Market. As the fish does not grow anywhere else, and there are no other significant farms, it is one of the rarest and best tasting fish in the world, says Murray Cod. The company claims it is a luxury fish that will always command higher margins, and that top domestic and international chefs have told said that it is the "best freshwater fish in the world". The company asserts that the quality is influenced by the intellectual property and technology it uses in the production system. This is a "cage/pond system" which it says is unique. The fish has a creamy white meat and in the past it was a premium table fish. In the 1880s very profitable commercial fisheries began in the Murray-Darling Basin and Australian consumption was over 500 tonnes per year. By the 1950s the wild catch had fallen to 311 tonnes and by the late 1960s to less than 30 tonnes. Murray Cod Australia says the fish has since been forgotten by Australian city consumers. However, the market outlook is now strong with awareness of the fish growing and the current growth in demand for the farmed cod outstripping the company's ability to supply it. There is potential growth in both the domestic and export markets, and while sales are all domestic initial exports to Japan should commence this month. But the rate of growth in supply is not fast as there are limited spawning production facilities and sourcing brood stock is difficult. Murray Cod Australia says its only competitors are small scale private enterprises and "backyard" producers. Total NSW production in 2018 was estimated at less than 265 tonnes. Although the Aquna cod sector is in its infancy, the fish are suited to aquaculture as they can handle a high stocking density, they have wide water quality requirements, their growth rate is medium to fast at 1 kilogram in 12 months, they can be weaned to artificial diets, and they are efficient at converting food to mass at a 1.1 to 1 ratio. The feed the company uses is designed for barramundi but it is developing its own ration. Murray Cod Australia's ponds are located in the Murrumbidgee Irrigation Area near Griffith in southern central NSW. The region has good quality water and land that is suitable for dam construction. Fish ponds at Bilbul, southern NSW. The company has a hatchery, a nursery, and grow out farms. Operationally, the land ponds mean less capital is needed. At relisting it had six dams and today it has 20. Its next development is initially for 35 ponds with 15 and 20 megalitres each. These ponds will hold 1.6 million fish and increase Murray Cod's holding capacity to 2.45 million fish. Murray Cod says its operations are energy efficient. 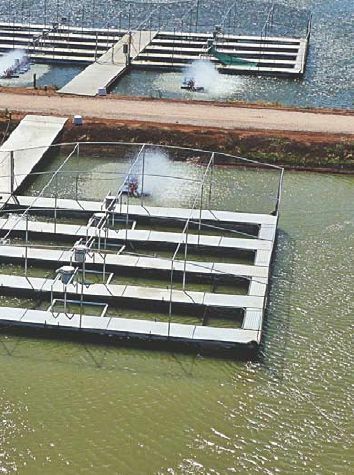 It uses solar energy and quality pumps and aerators. As well as growing fish in its own ponds, it sells fingerlings in cages to contract growers for grow-out on the farmers' dams. The company uses a capital lite model where it has 15 year leases for the ponds. The farmer builds the site including earthworks, plumbing and electricals. The company operates the site using its own pen systems and fish stock, and it bears all operating costs until the fish are saleable. Murray Cod harvests all fish after about 18 months when they weigh 1.5 to 2 kilograms each. Adding more contract growers is not a priority as the focus is on quality and consistency. The company has three products: fresh fish, sashimi, and initial quantities of hot smoked Murray cod are expected to be available before June. Production is outsourced but a processing facility is on the way and should be commissioned before 30 June. The current wholesale price for head on gutted Aquna cod is $23 to $25 per kilogram. This compares with $12 to $14 for farmed Atlantic salmon and $8 to $10 for barramundi. Murray Cod's costs include $7.70 per kilogram for growing the fish and $1.50 per kilogram in processing and selling costs. The company currently has 1.5 million fish in stock of which 850,000 are in its own ponds. It is working to increase production, which was only 40 tonnes in 2017. It says capacity is now over 1,000 tonnes and it is aiming for 10,000 tonnes before 2030. 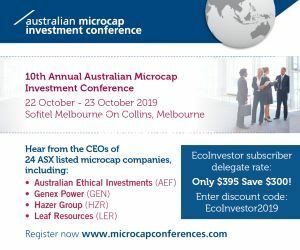 Financially, Murray Cod Australia is a pre-profit company. It had December half revenue of $3.3 million and this was up on $2.2 million in the December 2017 half year. The revenue comprised $1.6 million in fish sales, $1.5 million in changes in the fair value of biological assets, and $0.2 million in equipment sales. The company said sales were up 100 per cent on same period last year. Its loss was $407,632. The company had total assets of $14.5 million and net assets of $11.4 million. Borrowings are low at $1.45 million but cash was also low at $0.4 million. The company has 392,659,015 shares and 524,437,586 shares fully diluted. The difference is 90,350,000 options and 41,428,571 deferred consideration shares and performance rights. The share price was traveling at around 6 to 8 cents until July last year when it jumped to a peak of 23 cents. Recently it has been trading between 16 to 18 cents. Murray Cod is in growth mode. It needs to successfully upscale its operations, increase its sales and revenue, and achieve positive cash flows and sustainable profitability. No timetable has been given for profitability so it may not be soon.